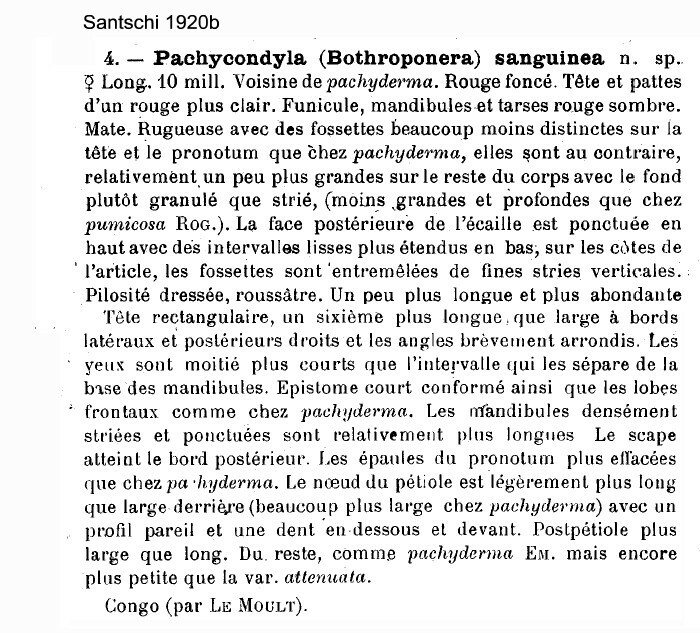 Type location "Congo" - the only "Congo" location visited by the collector Le Moult seems to have been Fort Crampel, Central African Republic (Pachycondyla (Bothroponera) sanguinea, Santschi, 1920b: 7, worker; new status Schmidt & Shattuck, 2014: 76) collected by Le Moult; no images on Antweb (June 2014). worker only described (Bolton, 1995) . Santschi's (1920b) description is at . The photomontage is of a worker from Congo, R閟erve de L閟io-Louna, collector Eric Zassi (14-t-1-1). Collected by: Method: Berlese funnel litter sample. Note my opinion that W L Brown's identification as Pachycondyla pachyderma was erroneous. That is black with distinctive red spots on the posterior of the gaster segments.